How can I improve the intuitivity/UX of the depicted tree structure? In our application we have a customer/user tree structure. Depending on the role signed in a level of the tree will be displayed, where a Super User (SYSTEM) sees all and a Customer (eg. Ford) sees himself and all branching/nodes beneath him. As you see, all customer nodes have the same structure, it has a Customers node and Users node. There is also a search/filter feature that will expand the branches to the node and select the node that is searched for. As a node is selected, a sheet to the right of the tree view will display a table of the node content and provide user actions such as "Create new customer" or "Create new user". The problem though is that there is now no good representation of which nodes in the tree are customers and which are users, and also which nodes are merely branching/category nodes, such as the Users and Customers nodes. The only good feedback existing now is the communication of hierarchical relations, shifting nodes in and out depending on its hierarchical abode, which of course already is in the nature of tree structures. I would appreciate some input in this matter. How can I clearly communicate the structure of the tree and of what type a node is? Maybe you've seen a similar tree structure that had a good solution to the problem? If I'm to use icons, then what would intuitively differentiate a Customer-icon from a User-icon? If you feel that you could provide any informative feedback or nice UX suggestions on either of these queries I have, I would greatly appreciate it. Your tree is unclear, because it repeats the same nodes at different levels. Get rid of the repetition. For me, it is not clear what this actually means. Are you trying to represent a network in a tree widget? If you must use a tree, use one that uses visual hints to connect nodes of certain level. Can you really judge what the parent of your GM node is? If I understand you correctly, you need to display a data structure of Customer nodes, where each Customer can have both Users and other Customers. Right? One way to simplify the tree a lot is to get rid of the intermediary level you now have in your tree: the Users and Customers items. Because these repeat throughout the tree, they confuse more than that they help. If you put customers directly under other customers, the tree gets much simpler already. However, you will need a distinction between customers and users, of course. Use of a different icon and sorting the customers above the users in the tree would help. Compare how folders and files are distinguished in a file manager. All this assumes of course that there are no circular customer relations, otherwise you end up with an infinite tree depth. If that is the case, you don't have a real tree hierarchy but a network, and perhaps you should display it as such then. This yields a list of matches for your users to select. This is best when your users know what they’re looking for, e.g., an entity name ADMVO. They can type “ADMVO” into the Search identifier blank and get the desired result. No need to think, “who is ADMVO a customer of again?” Nonetheless, it can also be used when your users can’t recall the identifier but know the entity is customer or user of someone else and they will recognize it when they see it. I’m assuming your users don’t think in terms of multiple levels of relationship such as “I know the entity I want is a customer of a user of Ford,” or “I need to retrieve all customers of customers of users of customers of GM.” That just seems human-infeasible. If the purpose of the UI is to explore and edit the relations among entities, the UI depends on the structure of the relations. Your example suggests you don’t have a hierarchy at all, but a network structure of relations. This is the case if a given entity (e.g., Volvo) appears on more than one branch (e.g. 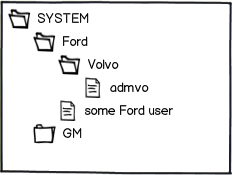 it’s customer of Ford but also a user of GM, and also maybe a user at the System level). I suspect you users will be confused by trees where the same “leaf” appears on difference branches –it breaks the tree metaphor. UI #2a If your network is relatively sparse (not a whole lot of connections between entities), then consider a node-link diagram that users can zoom, pan, and filter. Arrowheads on the links can show who is a customer/user of whom, and the shapes of the arrowhead (e.g., hollowed versus filled) or lines (e.g., solid versus dashed) can code the relationship type (user or customer). A tool palette provides pointer-tools to add new links, and any link can be selected for moving or deleting. UI #2b If the network is too dense for node-link (many interconnections), then consider a square grid with entities listed across both the top of the columns and down the rows. Entities in the rows are potential users/customers of entities across the top. Cells of the grid code type of the relationship between each pair of entities. Users can pan and filter the grid. 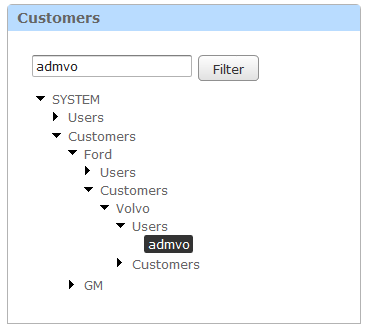 Your users can select any cell(s) and change the relations through menu commands. For both #2a and #2b, your users can select an entity and open a window for it showing its details (attributes). If the purpose of the UI is to study and edit the attributes of the children (users and/or customers) of a given entity, then consider a master-detail UI with three panes. The top pane provides attributes for a single entity (which may have been selected using UI #1). The next pane lists the users and their attributes in a tabular layout, and the last pane lists the customers and their attributes in a tabular layout. Your users can view, compare, and edit the attributes of the users or customers directly in the tables. Put the tables in expanders and your users can show or hide customers or users as needed, much like a tree allows. Your users can edit relations by cut/copy/paste of selected entities from one child pane to another (including another in a different window for a different parent entity). As in UI #2, users can select any entity in either child pane, and open a window for details on that entity (e.g., who are its customers and users). Not the answer you're looking for? Browse other questions tagged tree categorization relations or ask your own question. What is the expected paging behavior of a tree? How to load data into a table based on the selection in a tree? What would be UI solutions for exploring mid-size hierarchies (100-3000 nodes)? Best UI to create complex data structures; Node Tree, List Tree, Miller Columns, or something else? Always show the expand button in a tree?